Have you ever noticed the proliferation of signs telling you what you can and can’t do? I noticed it particularly at the weekend, when I went to Bristol for the Harbour Festival. After five long hours sitting in traffic on the M25, M3 and then M4, being told not to go above 50mph through the roadworks, I eventually arrived all hot-and-bothered in Bristol and promptly had a bad nose bleed. This led to a trip to A&E, where signs on the wall warned me not to abuse the staff. Realistically, given the prevailing conditions on the motorway, I could have gone above 50mph only in my dreams; and I could barely speak while at the hospital, let alone abuse anyone convincingly. Later, there was a positive rash of didactic signage at the harbour festival. “No skateboarding, cycling or roller-skating” instructed one sign. 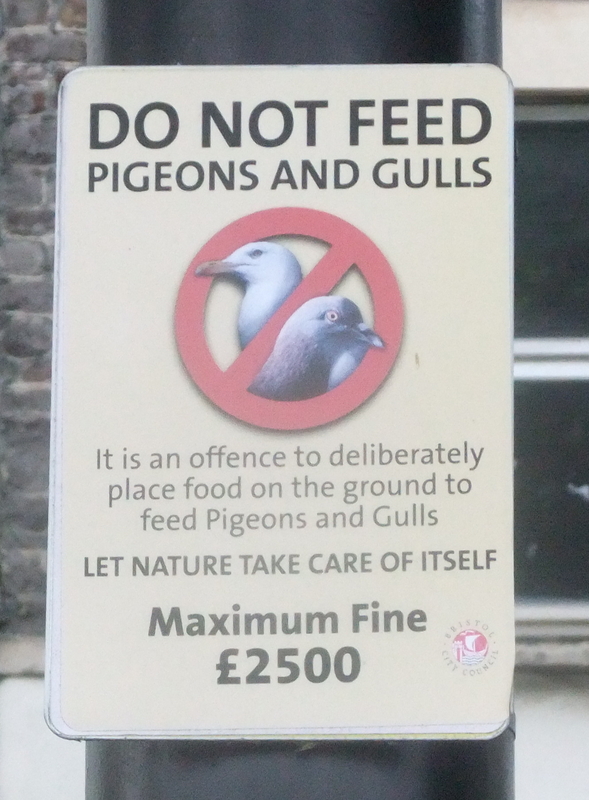 “Don’t feed gulls and pigeons” stated another. “Warning: anti-climb paint”, added a sign on a ruined church: in other words, “Don’t climb on the church”. Elsewhere, we were told “Don’t let kids play in the parking area” and were ordered to desist from playing ball games on the green. Where the bossy signage left off, bossy people took over. Taking a photo of a policeman for my collection of random photos, I was astonished when, as the shutter clicked, he held up his hand warningly, saying “No pictures!”. What sort of police state are we in, I wondered. It was only when he added, rather self-consciously, the cliché “move along, please”, that I realised he was a pretend policeman, some kind of street entertainer, presumably. Anyone with sharper eyesight than mine would have realised this earlier from the fact that what I thought said “Police” on his jacket actually read “Polite”. It was time for a cooling drink and my friend and I bought mojitos from a drinks stall and went and sat on the harbourside to drink them and watch the boats go by. We’d barely taken a couple of refreshing slurps when the festival security people appeared from nowhere and told us to move along. We weren’t allowed to sit on the harbour, presumably in case we fell in and got drowned or got Weil’s disease. My companion showed signs of getting obstreperous. She was tired and hot and had been particularly looking forward to her mojito. She asked the security people which rules, specifically, forbade us from sitting on the harbour, who imposed those rules and whether they had done so just to annoy her. I could see this leading up to a “whatcha going to do about it then? You and whose army?” type of conversation, so I suggested we finish our drinks and decamp to a smashing little pub we know. What a gem of a place. Liberty Hall for the thirsty visitor who’s fed up of censorious signage and officious officials. No-one minds if you get a bit over-excited and clamber up on the bar for a dance, no-one minds if you sing, or wrap a fellow customer in clingfilm or sprinkle talcum powder down a friend’s cleavage (as has been known). As a political backlash against all the rude signage we’d seen, we made some of our own, by drawing childishly-lewd images on the pub blackboard in chalk. The landlord’s a tolerant sort and is easily amused, so he had the tact and diplomacy to wait till we’d left before rubbing our scribblings off. But it occurred to me that he really ought to take the lead from his fellow Bristolians and take a firm line on this sort of thing with a sign saying “Don’t draw willies on the blackboard”.